As we’ve all been recently reminded of the important role Congress plays in ensuring the day to day functions of democracy, it can be useful to keep in mind the history of one of our most influential government institutions. 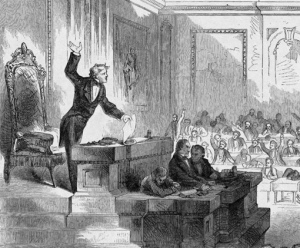 19th Century Masterfile now includes the indexes to the Annals of Congress, the Register of Debates and much of the Congressional Globe, bringing our coverage of Congressional papers up to the 39th Congress in 1867, with greater coverage planned in 2011. The Annals of Congress, Register of Debates and Congressional Globe, as the precursors of theCongressional Record, are an extraordinary cache for research materials, covering the growth of the nation from the Continental Congress to the beginning of the Industrial Age. Before Congress began publishing its own debates and proceedings in 1873, Joseph Gales and William Seaton began collecting and selectively publishing early summaries of the proceedings; first, in what they called the Annals of Congress, covering the first 18 congresses (1789-1824); as well as a report of the leading debates of Congress in the Register of Debates (1824-1837). Additionally, in 1833, Francis Blair and John Rives began a newspaper-like publication called theCongressional Globe with daily coverage and bound volumes at the end of each session. It also contained presidential messages, certain executive department reports, and the text of public laws.